[Saturday 11 December, 1993] Whoa! It seems I have too many options to choose from for a stimulating evening: diary, letter home, post cards, reading, or attending a party in our hotel. I decided that writing here was the most important. Confession: Silly me yesterday forgot that today was Saturday and didn’t change any money [we were using travellers cheques!]. As a result H is the bank but is about to run out of cash herself. Ooops. We finally checked out of Hotel Belle View in Corinth this morning, then left our packs at the hotel for the day while we caught the bus to Mycenae (Mikines). Today was really warm, and after walking over 4km from the bus stop to the archaeological site, we were stripped down to T-shirts. 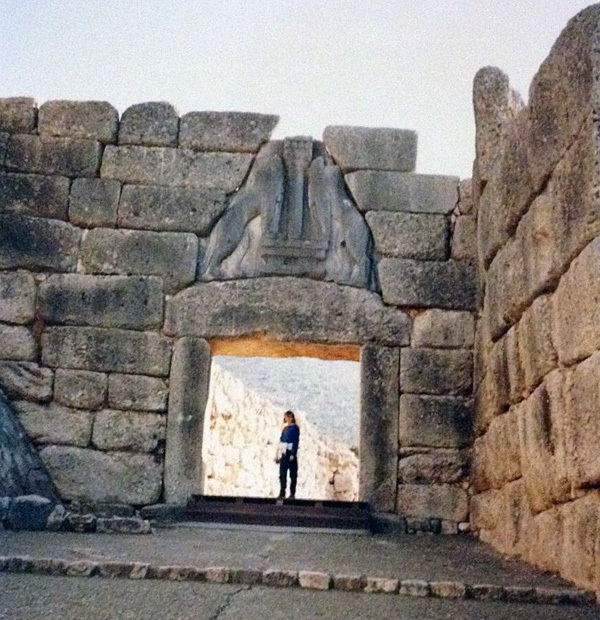 We saw the tomb of Agamemnon and the Mycenaean acropolis. For a civilisation 1300-1600 BC to have built the rocky walls we were sitting on is quite incredible, and at least we have now seen the legendary Mycenae. Afterwards, we caught the train to Athens, and about half an hour out we were set upon by British and Australian hotel “runners”. At first we had no clues: A British guy came up, said “You staying in Athens?” Yes. “I’ve got some accommodation to offer you”. This was making life easy! But he was not the only one. Next came two other Brits offering a similar deal in another hotel, and lastly an Australian. We picked the one with the shortest walk to the underground train station. [Monday 13 December, 1993] Well, the first thing to admit is that H and I missed our ferry to Mykonos yesterday. The alarm was unsuccessful, and we woke with a jolt at 7:45, 15 minutes before the ferry left from Pireaus. Ooops! It’s actually turned out for the best, because the museum was free yesterday, being Sunday, and the archaeological site at Delos would have been closed today, being Monday. We therefore had a leisurely morning in Athens. The National Archaeological Museum I found a bit exhausting. It was inevitable, I suppose, that we’d go carefully, reading all the captions, for the first few hours, but we raced through the ceramic section (a whole floor) in five minutes flat, and were getting very tired of grave steles and torsos by the end. The statues in marble and bronze were by far the most interesting — especially bronze statues of Poseidon, the youth (?) from Marathon, and another of possibly Paris or Hermes holding an apple. Also a marble statue of Aphrodite, Pan and Eros found at Delos. In addition, the prehistoric collection of all the gold-leaf work and bronze weapons etc found at Mycenae and others was stunning. It included some stone tablets with linear beta inscriptions — wow! But the discus thrower wasn’t there — where he is, we still know not. Today we DID catch the 8:00 am ferry! The ferry pulled into Mykonos around 1:30 pm, revealing a town of white-only buildings with red or blue or green painted shutters, doors, rails. Everything is in a generally good state of repair for Greece — tourist bucks I guess. One of the things we noticed is that they painted the cobble-stones on the paths to look more prominent. The overall effect is surprisingly good. Mykonos town consists of little “paved” streets which form a labyrinth of white buildings (with coloured shutters). There also seems to be a few windmills around. Tomorrow morning we are going to Delos [a small uninhabited island near Mykonos]. Our landlady told us that the boat only ran if four people wanted to go — so we hunted up two other backpackers we had seen get off our ferry to see if they were interested. They are, so we are meeting someone at 10:00 am. I’m rather looking forward to Delos, as it was the centre of all culture for around 1000 years! 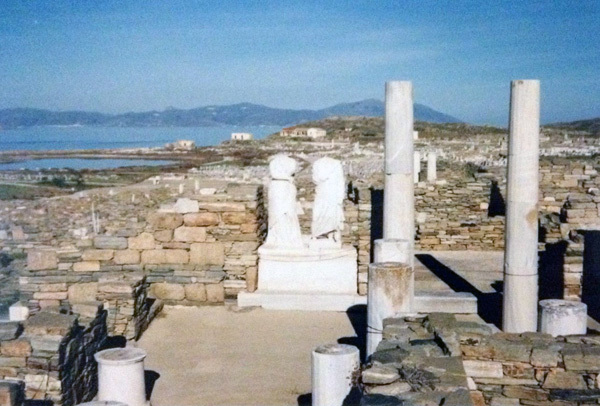 [Thursday 16 December, 1993] The island of Delos was fantastic, and once again the weather was glorious. We got there about 10:45, and it was magic. The ruins are vast and there was no possible way to see them all in the two hours we had until the boat returned. Nevertheless, we made a good effort! Being on a tiny island (~5 sq km), the atmosphere was perfect — the dreamy blue sea lapping gently against the rocky shores, the ancient, proud marble columns standing tall above the abandoned slabs and rocky walls. We visited the theatre and all the houses surrounding, and the hillside on which most of the temples were perched, and the large area of temples, stoas, agoras etc. Yet again there was a temple to Apollo, but also to Athena, Aphrodite, Hera, Isis… The stadium was mostly gone, but it was perched, with the gymnasium, right next to the sea. Unfortunately our time was so limited because we needed to catch the ferry to Piraeus at 2:45. Oh well, what we saw of Delos and Mykonos was worth every extra cent we spent to get there! Yesterday, our last in Greece, we spent in Athens seeing the Ancient Agora and its accompanying museum, and looking around the Plaka. The Agora possesses one rather grand building which still has a roof, but the rest of the ruins are not as well preserved as Delos, nor as magical as Delphi or Olympia. The Plaka is the old part of town, and very touristy. The souvenir shops all sell the same things: famous statues in a wide variety of sizes, ceramic jars etc, patterned crockery, T-shirts. The atmosphere is bustling and the buildings are all very quaint. And above the Acropolis soars. Thus ends the Greek section of my 1993 adventure. To this day, it remains one of my all-time travel highlights, and I always wonder whether it was because it was the first place outside Australia I ever visited. What was the first place you ever visited? What place does it hold in your heart? This Greek Adventure does sound like a Major Travel Highlight – and not just because it was your first stop outside of Australia. The first place I visited outside of Canada was Fort Lauderdale, Florida, USA. It was fun, but no special memory. Perhaps, but I’m sure it being the ‘first stop outside Australia’ was a contributing factor. 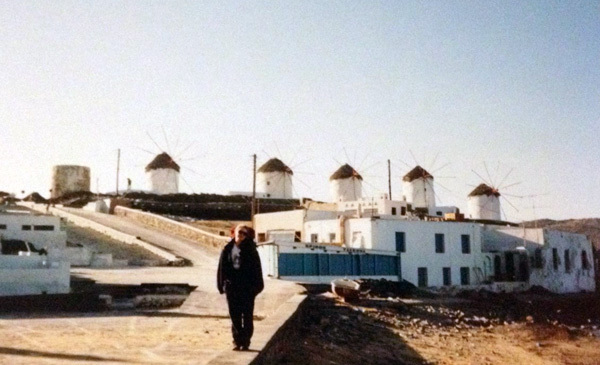 I’ve long wished to go back to Greece — would it live up to expectation 20 years later? Probably not… I don’t think I could ever recapture that sense of WONDER and JOY I had back then… Greece was so different from anything I’d seen – and so ANCIENT! Definitely the place for gorgons… The island is very flat too. I’d really like to go back there someday. We must have been running out of film or something, because we only took ONE PHOTO of Delos between us! (We were both using old film cameras and pooled all our photos.) These days I think I would have taken about 100! !